July 16 - Our Lady of Mount Carmel - Optional Memorial - My Catholic Life! A few miles from Lebanon, near Haifa, a large city in the north of present day Israel, is the Holy Land’s Masada of Catholic prayer and spirituality. Mount Carmel rises high into the sky, dominating the landscape below. On this promontory one of the most dramatic, and memorable, scenes of the Old Testament unfolded. In the ninth century before Christ, the prophet Elijah made a death challenge to hundreds of pagan prophets to determine if the God of the Jews was greater than Baal. Two altars are built. Wood is laid about both. Two oxen are slaughtered and placed on the altars. The pagans pray to Baal to accept their sacrifice. Nothing. They pray through the morning. Nothing. They pray through the afternoon. Elijah mocks them. They cut themselves, adding their blood to that of the oxen. Still nothing. They step aside. Elijah steps up and gives commands. Yahweh’s altar is drenched with water. It is drenched twice more. Elijah pleads that Yahweh accept the sacrifice. And then…. a ball of fire cuts through the night sky and BAM! The water evaporates and the sacrifice is totally consumed by the blazing fire of the true God. Then the shocking revenge. Elijah orders that the throats of the prophets of Baal be slit. The order is immediately carried out at a brook that runs red. God showed His power in stunning fashion on Mount Carmel centuries before Christ ever walked the earth. Two millennia later, the Holy Land was Crusader territory. Chivalric Orders of Knights had conquered Jerusalem and dotted the Mediterranean coast with Crusader castles to protect the flow of pilgrims and soldiers to and from Europe and the holiest sites of Christianity. Some of those knights and dames knew Mount Carmel was holy ground. So in the crags, folds, and valleys of this isolated mountainscape, pocked with numerous caves and grottoes, hermits retreated to lead lives of prayer, fasting, and penance. When political and social realities changed by the end of the thirteenth century, and Christians once again lost the Holy Land, these hermits returned home and established new “Mount Carmels” throughout Europe, evoking the spiritual isolation of their lost mountain. The Order of Mount Carmel is an engine room of prayer, a religious family of both male and female contemplative religious. Carmelites’ radical dedication to contemplative prayer, detachment, poverty, and death to self has attracted, and formed, men and women of the greatest holiness: Saints Teresa of Ávila, John of the Cross, Thérèse of Lisieux , and Teresa Benedicta of the Cross (Edith Stein). 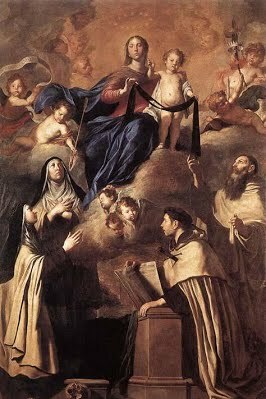 Integral to Carmelite spirituality is the Virgin Mary, under the title of Our Lady of Mount Carmel. The origins of today’s liturgical feast are somewhat unclear, but the underlying devotion is not. The Virgin Mary’s steady, quiet presence in the life of Our Lord is notable for its subtlety. Her inner life and secret generosity is what attracts, more than her actions or speech. No word is limited to a book. The Word of God existed from eternity in the Trinity, became flesh, taught, performed miracles, died and rose long before the Word was written down. Mary is the mother of that rich Word. Her word of “Yes” to the Archangel Gabriel gave space for the Word to dwell among us. In his 1994 book “Crossing the Threshold of Hope,” Pope Saint John Paul II wrote that “Carmelite mysticism begins at the point where the reflections of Buddha end…” The goal of spirituality is not to renounce the evil world but to unite to the personal God of Jesus Christ. Purification and detachment are not ends in themselves. They help one cling to God more easily. Our Lady of Mount Carmel is not a chameleon. She doesn’t change colors to satisfy any and all “spiritualities.” She is the mother of God, and the icon, par excellence, of the queen of the virtues—humility. Our Lady of Mount Carmel, through your example of humble docility to the will of God, we seek your intercession to make us more prayerful, more detached, more recollected, and more committed to whatever God asks of us.